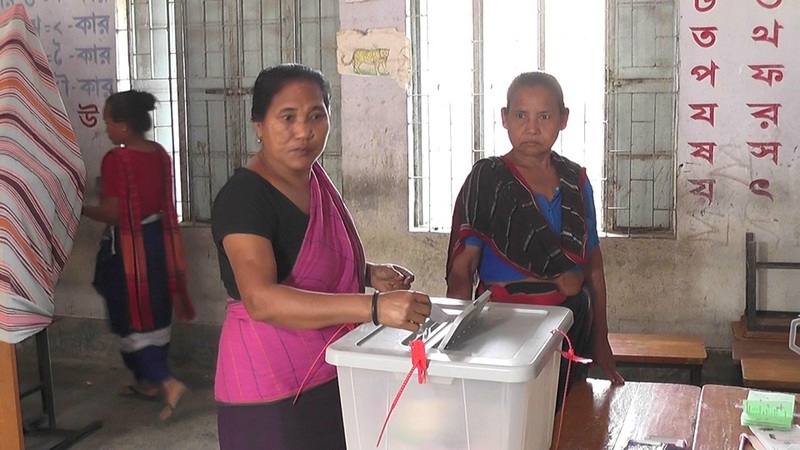 Photo: A voter casts her vote at a polling centre at Rangamati on Monday, March 18, 2019. Dhaka, Mar 18 : Voting in the second phase of elections to 116 upazilas in 16 districts began on Monday morning. A total of 377 chairman, 548 vice-chairman and 400 woman vice-chairman candidates are contesting the elections in the 116 upazilas where there are some 17,909,006 voters under 7,039 polling stations in 116 upazilas of 16 districts, including Thakurgaon, Rangpur, Gaibandha, Dinajpur, Bogura, Naogaon, Pabna, Sylhet, Moulvibazar, Gopalganj, Faridpur, Chattogram, Rangamati, Khagrachhari, Bandarban and Cox’s Bazar. The first phase of the election was held on March 10, while the third phase election is scheduled to be held on March 24 and the fourth phase on March 31.